Julie Anne San Jose and Elmo Magalona are dubbed by Total Girl Magazine as the "Teen Dream Team." Probably the Kapuso Network’s hottest tween love team, Elmo Magalona and Julie Anne San Jose or better known together as “JuliElmo” recently starred in their first romantic movie titled “Just One Summer.” You can also catch this pair in the sitcom “Together Forever” every Saturday and in “Party Pilipinas” every Sunday. 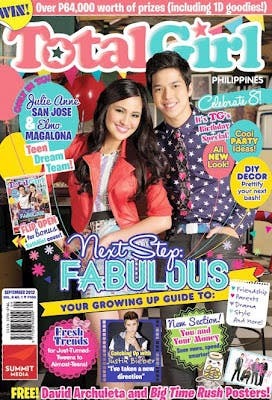 Aside from JuliElmo, the teen magazine also features interesting teen topics like “Cool Party Ideas (as part of TG 8th anniversary issue),” “You and Your Money,” “Growing Up Guide to: Fresh Trends for Just-Turned-Tweens-to-Almost-Teens,” “Catching Up with Justin Bieber,” and a flip open cover featuring the hit ABS-CBN loveteam of Kathryn Bernardo and Daniel Padilla. Total Girl September issue is now available nationwide wherever magazines are sold.